We all know that excited feeling when you take your new Android phone out of the box for the first time. The possibilities seem infinite – the battery will last forever, your phone will operate at lightning spee,d and you’ve never had more space for all your photos and music. But how long until that hopeful feeling fades? Often in no time at all, you see your smartphone or tablet slow to a crawl — all because of those apps you install. Keen to prevent this? In our global AVG Android App Report (Q2 2015), we’ve again, identified the top 10 apps that drain your battery, clog your storage, and use up most of your mobile data. What are the top app sinners? Snapchat! Oh Snap! 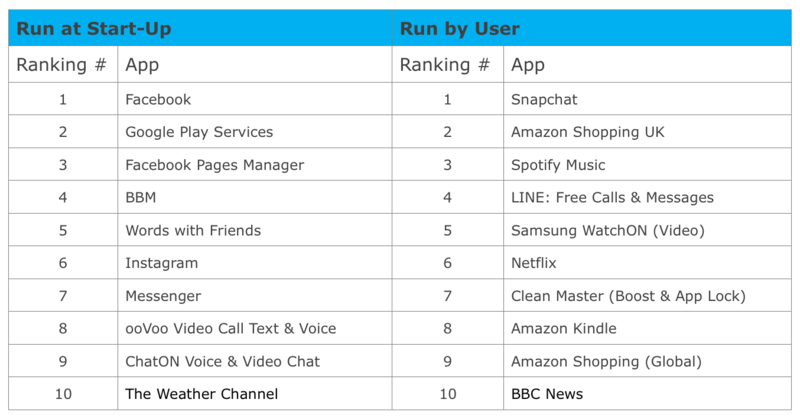 Forget Facebook, Spotify, or any of the preinstalled apps: In Q2 2015, Snapchat dethroned them all as the app which had the highest, overall performance drain. Did you know that while it runs, it makes use of the camera, Wi-Fi/mobile data and GPS functionality, simultaneously? This explains the high battery life and traffic consumption. Samsung Updates! The top, hidden battery-drainer this quarter was a service innocuously named “com.sec.android.fwupgrade,” which is responsible for delivering periodic Samsung updates to your device via Wi-Fi. As with the similarly update-heavy Samsung Security Policy Update (KNOX) and Google Play apps, the service has a massive impact on the battery life of your device. Your Browser’s a True Hoarder! Joining more obvious entrants on the top ten list this quarter, such as Spotify and Amazon Kindle, Google Chrome emerged as the second highest, storage-consuming app, thanks to its collection of your browsing data over time. Our advice here: Clean up your browser from the settings menu or use a thorough cleaner product. A drain on your wallet and smartphone: With two of its shopping apps in our top ten ‘run by user’ list, if you want to save data and battery life on the go, you might want to steer clear of Amazon. Read the entire App Report here. Now that you know about the top apps, what’s left for you to do? Stay tuned for our next blog on the top tips to optimize your smartphone and tablet.